4.2 out of 5 based on 85 bloggers and 19 commenters. 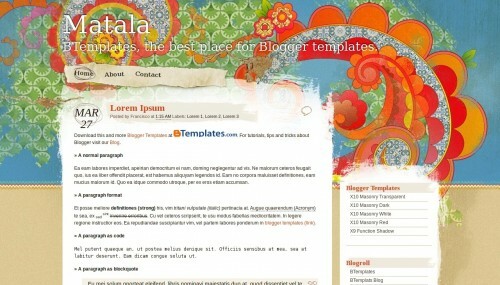 Matala is a free premium blogger template adapted from WordPress with 2 columns, right sidebar, grunge style, abstract, floral motifs, vectorial elements and vintage style. Excellent template for blogs about art, culture or to write a diary. Thank you so much. It is a beautiful template. I need help, the DATE on the example is displayed with the abbreviated month above the date below and no comma. This is how I want it however all the date options do not allow that. How was this done? The closest I was able to get displays the date with a comma and the Month under. For ex: 6, MAR and I hate it. If I choose any other style it runs into the blog title and looks messy hard to read. I really love this layout, but the date is turning up really big and it only says “MAY FRIDAY.” I’d really like to be able to see the whole date. Any way to fix that? I’m having the same problems listed above. Weird line breaks, and huge date font! I don’t know html and I want to fix it. Any help out there? Thanks!! To fix the date, go to Settings > Language and Formatting > Date Header Format > select the top option where the month is abbreviated. My only problem is that the template is putting the date before the month. Still haven’t figured out how to flip that around. But I’m a step closer, at least. If you click on Template > Edit HTML and then look for the following code, you can either remove it entirely, or put comment markers around it (which will leave the code in place, but it won’t use the code. It basically renders it inert). /* — This is where you can write a little note explaining why you’re turning this part of the code off. … because it makes lines that you don’t want showing up. Thanks Barefootmeg. I’m not sure I understand your directions. My changes look like this but not all the lines are missing. Is this right? Never mind, I figured it out. Thank you! Really interested in using this template for blog to uild momentum for the launch of an educational toy for kids. Would it be do-able to customise for different colours, graphics etc?